If humanity is ever taken over by an animal species, I would not like apes, pigs, or, (heaven forbid), dolphins to rule. I'd like our overlords to be elephants. Elephants passed the mirror-test, meaning, like human toddlers, they are capable of recognizing that the elephant reflecting back at them in the mirror is indeed them. This self-awareness will be crucial when they are leading the world, and have to look themselves in the mirror at the end of the day, with the weight of their decisions. 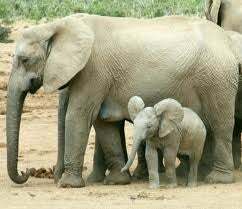 Female elephants are lead by matriarchs. The matriarch makes the day to day decisions of the group. That's a pretty feminist way of living, I'm down. Male elephants aren't loners, they live in their own groups, away from the females, with their own hierarchy. Elephants also have mourning rituals of their dead, and may cry when they're sad. Just like humans. Ever hear of a dolphin crying? No, you haven't, because a dolphin is cackling in delight over some unspeakable horror it just committed. Elephants also have the capacity to remember their past. Elephants have been noted to recognize individuals (or other elephants) from 20 to 40 years ago. In the wild, Matriarchs also remember locations of water to serve as sources of sustenance during droughts. Finally, in the documentary An Apology To Elephants, compelling evidence is shown that although elephants rescued from circuses do not forget the great abuse they've suffered at human hands, they have the capacity to forgive their tormentors once being rehabilitated. I can learn a lot from elephants. We, as a species, can learn a lot from elephants. If humanity loses it's grip on controlling the planet, I'd be Team Elephant for Overlords.